And after a giggling fit at a White House presser, the nation gets a new VP. We’re a little late on this recap, but this was an episode worthy of another look. 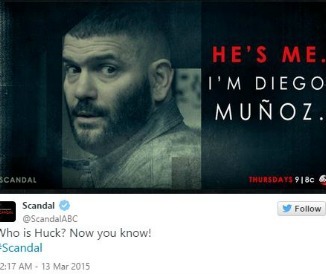 Let’s go ahead and tackle the first part of that headline: Diego Muñoz is Huck. In a previous episode, Huck gave his wife a ton of B613 files in the hopes of proving to her that he didn’t just ditch his family. Not only is she now convinced, she’s taken the information to AG David Rosen’s office hoping to blow the lid off of this ghastly thing happening in the US government. When Huck goes to Rosen’s office to give testimony about B613, it at first looks like he’s going to be tight-lipped about it. But when he’s asked about “the hole,” Huck reveals a ton of frightening details about how you keep your sanity in this dark, small space that he was forced to inhabit. “You have to have a routine or you’ll go crazy,” he says. He measured the size of the hole each day. Ate his lunch at the same time even when there was no food. Wrote letters to his wife and son. And used his imagination to take him to 195 countries where he walked and walked. Deep breath. Sip of wine. Annnnd we’re back. So you have to wonder whether this is really the end of B613. Of course, AG Rosen knew all about it. Now that it’s been discussed openly, he wants to “catch the bad guys.” Jake is understandably wary. But Papa Pope isn’t in charge anymore and they’ve been kind of quiet, so maybe? Who are we kidding… something is bound to happen. Back at the White House, Sen. Susan Ross decides to go full looney bird during her introductory press conference despite media training from Abby and unleashes a sound that should never be heard coming from someone in a position of power. That happened indeed. So where do you go from here? To Leo Bergen, a government PR consultant that we’ve seen in past episodes and the man that Abby is getting it on with now. (Also, he’s the ex on Girls Guide to Divorce, FYI.) But Leo gets a little too overzealous and Sen. Ross quits. Which prompts Abby to fire him. While they’re getting ready for bed. Ouch. So Leo takes out his mouth guard, puts on his pants annnnd he’s outta there. And where’s Liv while all of this is happening? Skulking around her apartment with a gun, shell shocked from her kidnapping. But she gets to shine when Abby comes to her to replace Leo. Liv manages to get Sen. Ross thoroughly prepared for a sharp appearance before the Senate committee charged with confirming her. But the officials on the committee still don’t like Fitz. Which is ridiculous if you ask us. He can be president, vice president and Secretary of Transportation if we have any say on the matter… because he’s driving us crazy! LOL… groan. But OK misguided Senate people. They’re angry about the way he went to war with West Angola, so Liv suggests he go to the Senate to beg for forgiveness. He’s not happy with that suggestion, but we get a tension-filled stare down between Olitz and guess who goes to the Hill to talk to the Democratic caucus?